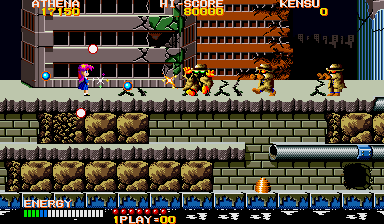 developers of Psycho Soldier, the 1987 “sequel” to Athena. It’s mainly just them griping about devhell. 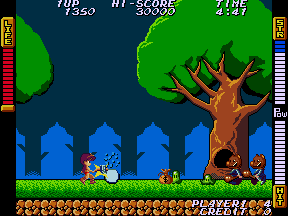 ● Back then, arcade games with female protagonists were fairly rare. 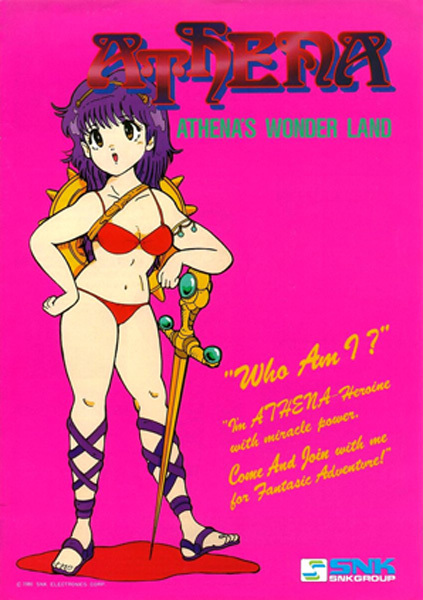 How did you come up with Athena? The idea mainly came from the planner, who had been thinking for awhile about making a game like that. Probably he just loves pretty girls! ● Her bikini costume made quite an impression, too. 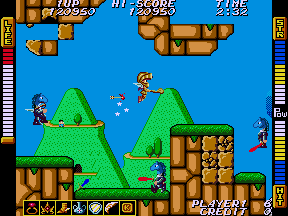 Athena is a game where you power-up your armor as you get stronger, so a costume like that was necessary for the game design. It honestly wasn’t done for titillation. The planner of Athena loves games with “upgrade” systems. He’s the guy who made the shmup ASO (Alpha Mission), after all. 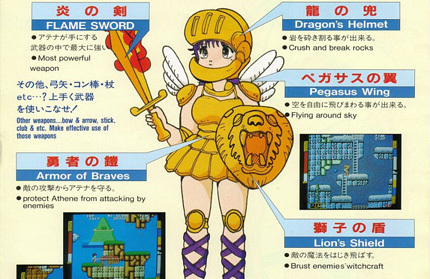 ● Did you have trouble translating her design onto the game screen? Once we started doing conceptual illustrations, we decided on her look relatively quickly: “let’s go with this!” But converting that to a sprite was more difficult. 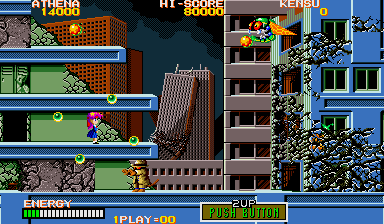 Pixel art was much more crude then: for instance, if her bust was too big by even a single pixel, it would make her legs look too stubby. We had far fewer colors available then, too. ● How was the response from players, at the time? 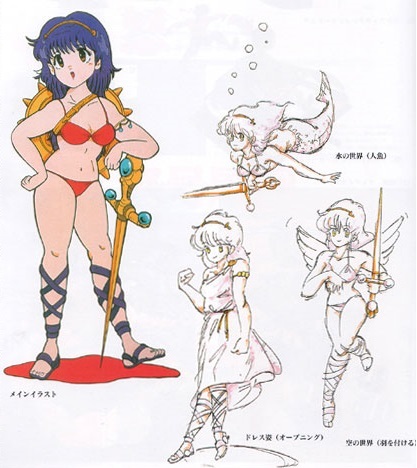 People responded well to Athena’s design, as we’d hoped. 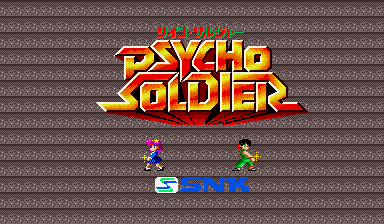 Even better, her popularity endured, so we got down to making a sequel right away with Psycho Soldier. 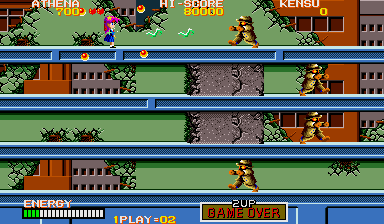 So everyone, this is important—if you want to see Athena on the Neo Geo, please let us know! It all depends on your support. ● By the way, what became of Athena after the events of the game? – “I hate Athena!” That’s what I thought when, right after the first game, it was decided that we’d have to start working on this sequel. If they come to me now asking for a third game… ugh, I don’t even want to think about it. - Goddammmmmmn, I’m exhausted! Goodnight. – Psycho Soldier…… here’s what I got out of these last 6 months: a lack of sleep, a habit of sleepwalking, a taste for energy drinks, and belly fat. What I lost? My girlfriend. Ugh. Give me my youth back!!! – Fail, fail, fail, fail, fail. Look, another fail! A storm of fails. Under a cold winter sky in the dead of night, I trudgingly make my way to the last train home. This is supposed to be the time when I make my mark on the world, but I’m just spinning my wheels… spin, spin my life away. How can I escape this…? I’m Kenny, the guy who made Athena a superstar singer and made her All-Japan Tour dream a reality. – For the big lizard enemy and final boss Shigu Do Dabide, don’t just look at their heads! There’s some subtle movement in their necks that you really should see. It is my masterpiece. 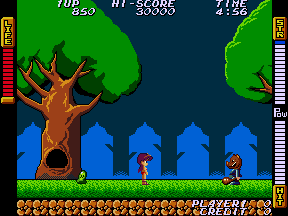 – This was my first game programming challenge. The long battle is finally over. At this moment, I can really feel how far my health has declined. Am I really an old man at 24? Cherish your youth, everyone… it only comes once.